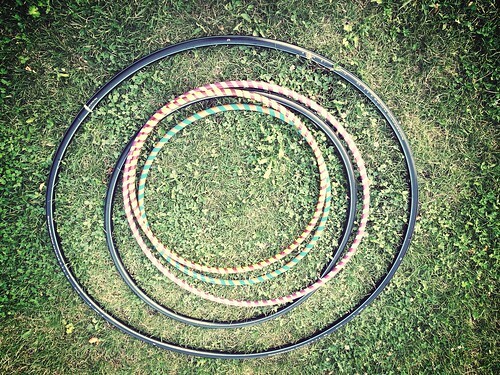 Here's my circles photo - some hula hoops me and the kids made this week. Some are made from scratch (and still need to be decorated), and others are up-cycled using electrical tape and old dirty hoops we found lying in the garden. My eldest has inspired me to have a go at hulaing (or hooping?) - she's so good at it - and, guess what! With my large, heavy, home-made hoop I can do it! For at least a minute at a time! I even have the bruises to prove it... And it's good for you too. My interweb research suggests it can burn 100 calories in 10 minutes and firm up mummy-tummy. But for the moment, we're just having fun in the sun. If you fancy having a go at making your own giant hoop, I recommend this tutorial which we loosely followed. I chose it over others because she has a happy sounding blog. And I didn't knowingly copy her photo idea, honest!